Autumn is here and so is pumpkin season. 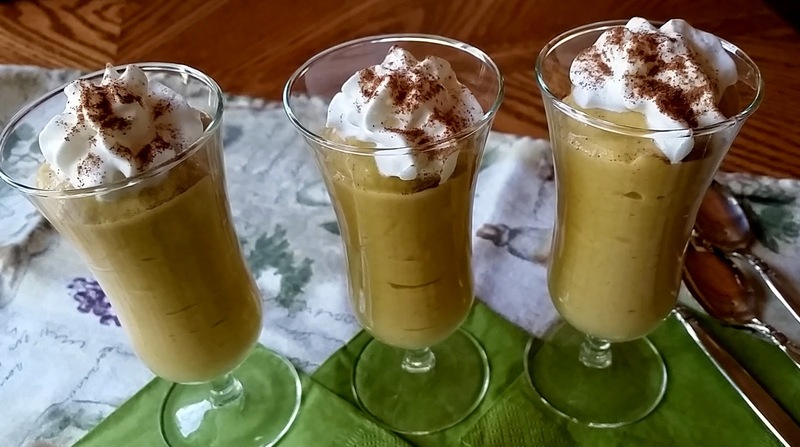 So many ways to use pumpkin, here is a very simple dessert that should please the pumpkin lovers in your family. Beat milk with dry pudding mix until thickened. Whisk in pumpkin puree and spices. Spoon into bowls and refrigerate for 15 minutes. Serve with whipped topping and a dash of cinnamon or sprinkle toasted and chopped pecans over the whipped topping and drizzle with maple syrup. Both are delicious. Yield: 4 generous half cup servings, in case you are wondering why I only display 3 servings is because I only have 3 of these fancy dishes, the last one was served in a plain dish. Delicious! I have made this and layered with crushed gingersnaps for more of a trifle effect. I thought you were going to say there are only three because you ate one of them - smile - I know I would have, they look delicious. What a great idea and recipe. A nice diversion from pie.